If you order a clutch for an older BCS tractor, it’s not going to look the same as the one currently on your equipment. In 2007, the company introduced the “New Style” clutch. This unit is backward compatible with tractors made as far back in 1995, but it integrates several components, making it easier to work on. Here’s how you can fit this new clutch to your old tractor. Which Clutch Do I Have? All BCS tractors made since 2007 came with the New Style clutch from the factory. If you have an older tractor and aren’t sure if the clutch has been replaced, look for a jam nut and set screw on the clutch next to the adapter plate. If it has one, it’s the older design. New Style clutches are compatible with 1995 and newer tractors. ¼ inch or 7/32 inch Allen head socket: BCS includes the 7/32 inch wrench which works with one-inch driveshafts that have a 3/8 x 24-inch thread set. All others use the more common ¼ inch bolt. Even if you can use the 7/32 wrench, you’ll still need a matching socket to torque the captive bolt. Torque Wrench — The needs to measure torque in ft-lbs. and work with your Allen head sockets. Bearing driver — An appropriately-sized socket can be used in a pinch. It needs to push on the bearing without catching on the clutch body. An impact wrench is useful, but not required. A pry bar may also be needed if the clutch is stuck on the shaft. The key, lock washer and bearing that are removed from the tractor will not be needed when installing the new style clutch. There’s a jam nut on the side of the clutch closest to the engine. Turn the clutch so the nut is lined up with the notch in the adapter plate. Place the straight edge on the inside flats of the L-shaped cone tabs at the end of the clutch. Use the measuring tape to measure the distance from this edge to the flat machined edge, not the inner raised edge, of the adapter plate. If the clutch is installed correctly, there should be 4.5 inches between the two points. If it isn’t, you need to check for damage or wear to the clutch and driveshaft. Loosen the jam nut using the 13 mm socket, then loosen the set screw inside the nut using the 4mm Allen wrench. The clutch should slide off of the engine shaft. If it doesn’t, use a pry bar between the adapter plate and clutch. Use the flathead screwdriver and hammer to pry out the crankshaft key. It should take just a couple light taps to get it out. Slide the lock washer off of the crank. Use the 14 mm socket to remove the bolts on the adapter plate. With the plate’s back side facing up, use the bearing driver and hammer to knock out the bearing. Reinstall the adapter plate, making sure each bolt is fitted with a washer. Slide the spacer onto the driveshaft, followed by the split bushing. Use the flathead screwdriver to spread the gap on the bushing to get it to go over the shaft. The spacer should be flush against the wide rear end section of the crank, and the bushing should be flush against the spacer. Slide the clutch onto the crankshaft with the flats facing out. Use the Allen wrench to hand-tighten the captive bolt on the end of the clutch. Check the distance between the clutch flats and the machined edge of the adapter plate. As before, the distance should be 4 ½ inches. It should be close to this measurement after the bolt is hand-tightened, and dead on after the bolt is torqued down. 3/8 x 42 – 25 lb-ft.
5/16 x 24 – 14 lb-ft.
7/16 x 20 – 40 lb-ft.
Recheck the distance between the flats and the adapter plate. Turn the flats at the end of the clutch, so they look like an “L” from the side. 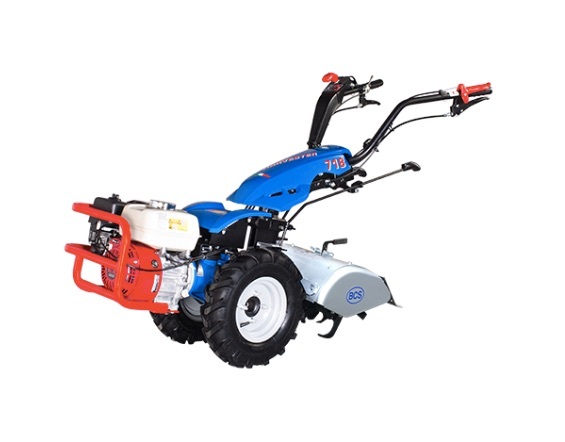 Shank’s Lawn Equipment sells and services a wide range of professional outdoor equipment including smaller brands like BCS. If you need parts for your tractor or you want a professional to handle clutch replacements and other repairs, visit our shop, located at 4900 Molly Pitcher Highway in Chambersburg, PA. That’s one mile east of I-81 from Exit 10. Looking for parts and accessories for your BCS tractor? We can ship what you need to any address in the United States or Canada. To order, visit www.shankslawn.com. This entry was posted in Uncategorized and tagged BCS replacement parts, BCS tractor clutch, Clutch for BCS Tractor. Bookmark the permalink.